The fee for the class each night is $5, and that includes supper. You do not need to bring a partner, as we generally dance in groups/sets of 6 (3 facing 3) or 8 (4 facing 4) - in fact, the Scottish Country Dance etiquette is that you share yourself around with as many dancers as possible during the course of the class. The class is informal - ladies skirts/shorts; men shorts (longs in the cooler weather) and flat, comfortable shoes. As long as you are reasonably fit and can dance to the beat of the music, you will enjoy the experience. Better still, Scottish Country Dancing is recommended by the Heart Foundation, and is almost guaranteed to slow down the onset of dementia!! BUT be warned: if you come back for a second or third class, you are likely to become addicted! 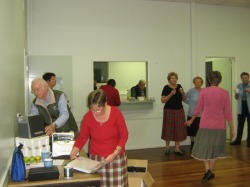 We dance from 7.30pm until about 9.30pm, and then enjoy a chat, cuppa and cake/biscuit. Visitors from other clubs are very welcome, and beginners are especially welcomed to our group. Come along and give it a go. We have full Public Liability Insurance coverage, in the highly unlikely event of some accident occurring. Scottish Country Dancing actually originated in France a few hundred years ago, and has evolved to what it is today, a combination of movements such as right-hands-across (otherwise known as wheels or stars), turns by the left hand and right hand, circles, reels, rights and lefts, and many other formations, which go to make up the various dances. 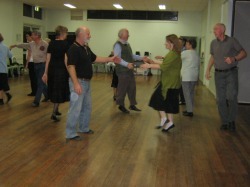 If you have ever watched square dancing, the movements are very similar - in fact, square dancing evolved from Scottish Country Dancing. Most dances are performed in what is called a 4-couple set, where the 4 ladies stand opposite the 4 men, partner facing partner. The couple closest to where the music is playing is called the first couple, and so on down the line to the fourth couple. The dance generally starts with the first couple doing most of the dancing for the first 32 bars of music, with support from the other couples in the set. Each couple has the opportunity to take their turn to do the dance. Unless the dance is very well-known, a walk-through of the dance is conducted for each couple before the music is turned on. You will be taught travelling skip-change steps to reel and jig beat, and to the slower, more elegant strathspey beat, as well as setting steps for the various types of music.